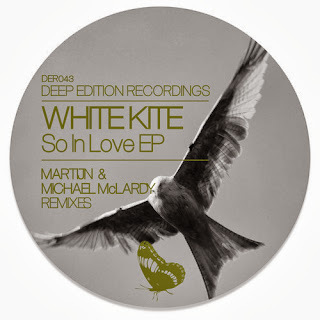 Deep Edition are swiftly (and deservedly) gaining a reputation as one of the most consistent labels on the scene. Launched three years ago in Newcastle UK, the label has brought founder Martijn and artists Graham Laverty & Michael McLardy to the fore, both as emerging talents and as tastemakers in their own right. 'White Kite' is a brand new project from Graham Laverty & Nicky Mann, and judging by this debut, we can't wait to hear more from the duo. Mournful vocals, offbeat bass, hypnotic percussion and warm pads are the order of the day on the standout title track 'So In Love', creating a deeply satisfying vibe. A second, more dancefloor-centric original track 'Get Back' plus remixes from Martijn and Michael McLardy complete the package in fine style. It's refreshing to see a young label based around a small group of key artists, all collaborating and co-operating to build something unique and special. Deep Edition really is a family affair, and not the kind of family you'll see on Jerry Springer any time soon either.